We love salmon, I do more than the boy, but it is still a favorite here and definitely on my top 10. I am always looking for new ways to make it, although, truth be told I have three or four go to recipes that we use all of the time. And I love it on the grill in the summer. The good part is, all of the health benefits. A couple of weeks ago I stumbled across this recipe and I knew we had everything (or almost, I changed it up a little) for it. One thing I have learned, quality ingredients just enhance the flavors in a dish. 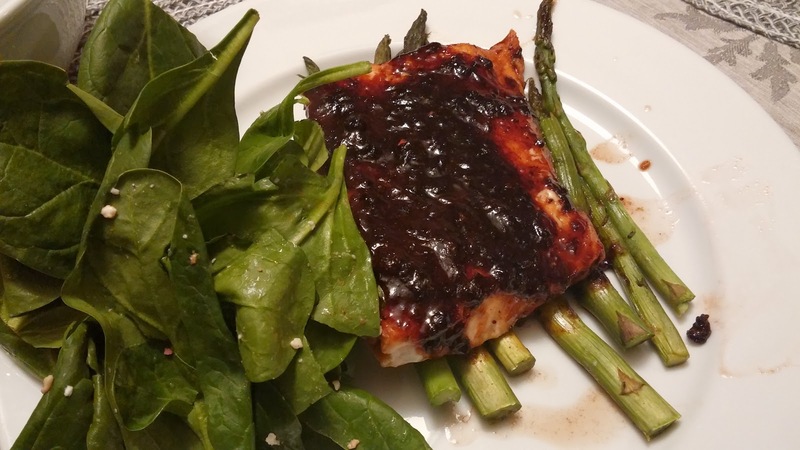 I always have a good aged balsamic on hand, I think that is one of the ingredients in this recipe that really gave this dish that extra flavor. I have also seen where the quality of the salmon makes a big difference. The majority of the salmon that we purchase is from either Costco or Whole Foods (great recipes on their site). We will buy a big piece of salmon from Costco and slice it up into portions for the two of us and freeze it. That seems to work very well for us, and we have never have a bad piece of Costco salmon, reasonably priced as well. Whole Foods is not shabby either, but we usually just buy enough for the meal we have planned. It always surprises me when people say that they don't like salmon, or that it is too fishy for them. Personally I find the opposite and of all of the fish that we make, salmon is by far my favorite. There are so many different ways to make it too. We added a simple spinach salad with a vinaigrette to round out this meal, absolutely delicious. And easy clean up, everything cooks in one pan! 1. Turn the oven broiler on to low. 2. 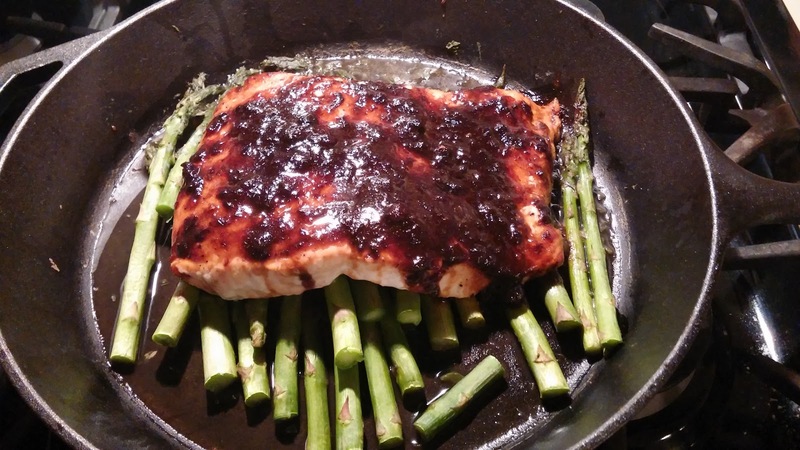 Place the asparagus on the bottom of a skillet that can go directly into the oven. I used our cast iron skillet and it worked very well. The flame should be on medium to high. 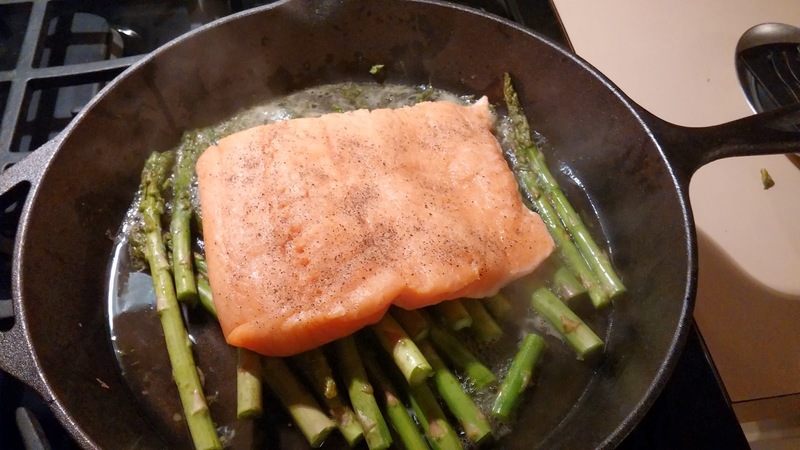 Pour the broth over the asparagus, place the salmon filets on top of the asparagus. Sprinkle with salt and pepper. Simmer the broth for 8 to 10 minutes. 3. 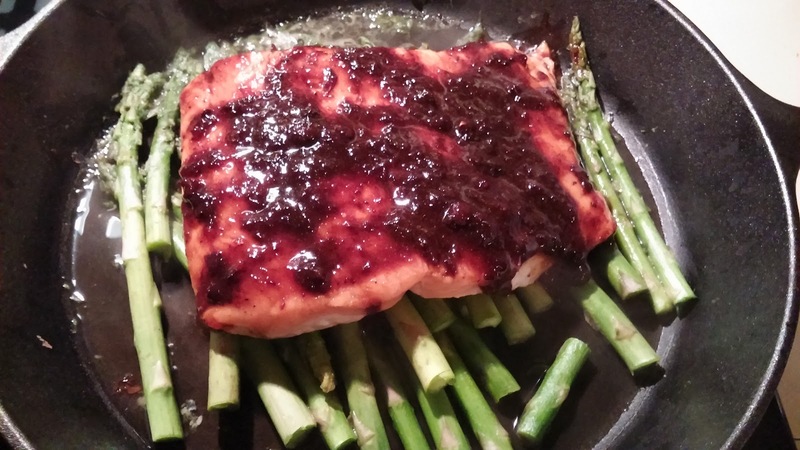 While the asparagus and salmon are simmering, mix together the jam, vinegar, paprika and cumin. 4. Spoon the mixture and spread onto the salmon. Place the skillet in the broiler and broil until the mixture begins to bubble, about 2 to 4 minutes. Do you have a favorite salmon recipe? I am always looking for new ones, here are a few of my favorites. (disclaimer - I have made each of these recipes at least once, the Spiced Maple Glazed is my "go to" salmon recipe though). One of our other simple salmon recipes is just to bake it in the oven and add a salsa on top! I love salmon as well! This looks delicious. 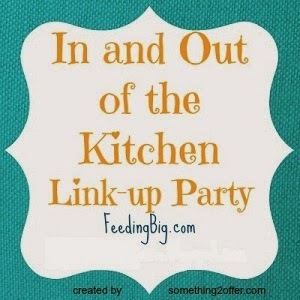 Thanks for linking to the In and Out of the Kitchen Link Party. Hope to see you next week. Congratulations!! 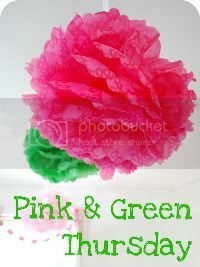 Your recipe has been featured at Tasty Tuesdays 46 on my blog, Lori’s Culinary Creations. Hop on over and grab a feature button and link up your latest culinary creations. Congrats again.